Sunday 29th Jan 2017. 10am-1pm Clearing vegetation around entrance areas to the site in preparation for planting. Path edging and litter picking. Sunday 12th Feb 2017 10am-onwards. Installing signage sleepers and benches. Sunday 19th Feb 2017 10am-onwards. Installing signage sleepers and benches. Sunday 26th Feb 2017 10am-1pm General site maintenance, litter picking, bird table installation. 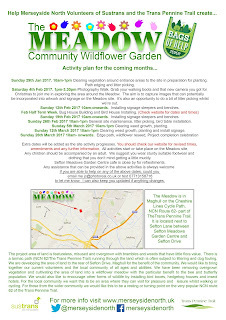 Sunday 5th March 2017 10am-1pm Clearing weed growth, planting. 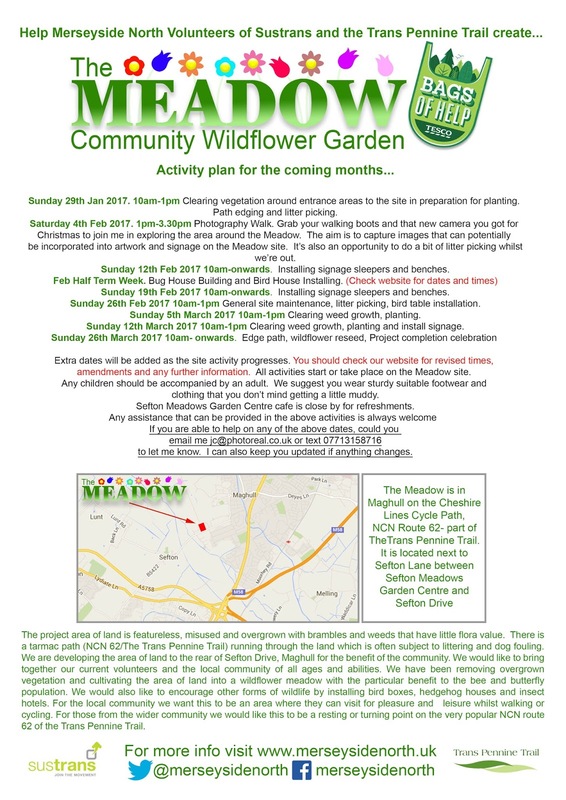 Sunday 12th March 2017 10am-1pm Clearing weed growth, planting and install signage. 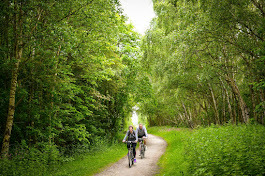 April Onwards... Activities and maintenance will progress beyond the Meadow site in particular up the Cheshire Lines. Extra dates will be added as the site activity progresses. You should check this website for revised times, amendments and any further information. All activities start or take place on the Meadow site. Any children should be accompanied by an adult. We suggest you wear sturdy suitable footwear and clothing that you don’t mind getting a little muddy. Sefton Meadows Garden Centre cafe is close by but I will endeavour to provide some light refreshments on site. Any assistance that can be provided in the above activities is always welcome. If you are able to help on any of the above dates, could you email me jc@photoreal.co.uk or text 07713158716 to let me know. I can also keep you updated if anything changes. If you have any questions, again please don't hesitate to drop me an email. Below is a flyer with the above information.